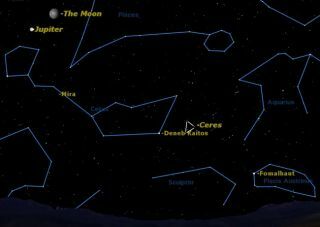 The dwarf planet Ceres is in opposition this Friday September 16 in the constellation Cetus. There was a great deal of furor and fuss five years ago when the International Astronomical Union demoted Pluto from a planet to a dwarf planet, but nobody paid much attention to the fact that at the same time they elevated Ceres from an asteroid to a dwarf planet. Ceres was the first asteroid to be discovered, by Giuseppe Piazzi on the first night of the nineteenth century, Jan. 1, 1801. Ironically it was initially classified as a planet, then reclassified as an asteroid, a term coined by William Herschel because of the star-like appearance of these tiny worlds. Even though Ceres is now a dwarf planet, it has not lost its designation as an asteroid, so it is both the largest asteroid and the smallest dwarf planet. As an asteroid, Ceres is unusual for its large size, at 595 miles (957 kilometers) in diameter, almost twice as large as the next largest asteroids, Pallas (326 miles or 524 km) and Vesta (318 miles or 512 km). Ceres is clearly spherical in shape, one of the distinguishing characteristics of a dwarf planet, as opposed to the rather lumpy shape of most asteroids. Astronomers measure the brightness of objects in space using a scale called "magnitude." On that scale, the lower the magnitude number of an object, the brighter it appears in the sky. Because Ceres is only magnitude 7.2, you will need binoculars to spot it. Look low in the southern sky a little past midnight. The only first magnitude star in this part of the sky is Fomalhaut in the constellation Piscis Austrinis, the southern fish. The next brightest star is Deneb Kaitos, "the tail of the whale," in the constellation Cetus, a bit to the left of Fomalhaut. Look just to the right of Deneb Kaitos and you’ll see a small triangle of 4th magnitude stars, as marked on this sky map. These point to Ceres. If you sketch this triangle and its surrounding stars from night to night over the next week, you'll spot one "star" that moves: that's Ceres. While having a look at Ceres, be sure to also look for the famous variable star Omicron Ceti, known as "Mira," the Wonderful. It is currently coming off a very bright maximum and is brighter than any other star in that part of the sky, about 3rd magnitude. See if you can see its characteristic red color. Ceres was originally named "Cerere Ferdinandea," but this was soon simplified to "Ceres," the Greek goddess of plants and agriculture. Our word "cereal" comes from the same source. Two years after Ceres was discovered, a new element was also discovered, and was named "cerium" after the asteroid. Cerium oxide is used to polish the lenses and mirrors used in telescopes. In amateur telescopes, Ceres never appears as anything larger than a point of light, but the surface of the dwarf planet has been imaged by the Hubble Space Telescope. NASA's Dawn spacecraft, currently orbiting Vesta, will move on towards Ceres next year, arriving there in 2015.